← Snowkayaking – A New Extreme Sport? There’s no doubt that longboards are all the rage right now. Every street you walk down you will have a good chance of seeing someone casually cruising down the street with an air of grace and finesse that looks almost effortless! Looks aren’t deceiving either, as one of the big appeals of longboards is just how easy they are to get to grips with as a rider. Longboards are not built for ramps or street stunts, but are perfect for cruising the streets, and even better for long downhill stretches. These longboards have extended the market for skateboarders, encouraging surfers to take to the streets as well as regular skateboarders looking for something a little bit different. There’s no doubt that this excellent longboard is a great introduction into the world of longboarding. With fantastically stable trucks and big, durable 70mm wheels, you immediately feel safe on this board, and the already straight forward task of adapting to this mode of transport is even easier! The quality of construction is immediately evident. A beautiful finish of bamboo really helps this board to stand out, but there’s no need to fear when it comes to what’s underneath. A multi ply maple is layered underneath the bamboo top surface, giving the flex required to really carve into those corners, although it feels as if the bamboo top plate gives a bit more rigidity which is ideal for beginners. Considering the price of this board, it should come as no surprise that it is earning rave reviews online. It offers style, quality, ease of use as well as longevity, and that’s about all you can ask for at this price point. It’s probably best suited to a beginner, but it’s reassuring to know that it is built to last, because plenty of intermediate boarders would be happy to have this under their feet, even when it comes to challenging hills and a desire to hit top speeds. The board is easily maneuvered, fast down the hills, and the kick tail gives it plenty of balance. It might not compare to boards which are several more times expensive, but in this price band it is hard to beat. 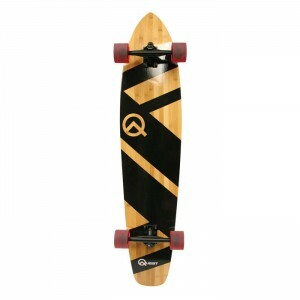 This entry was posted in Other, Reviews, Skateboarding, Skateboards and tagged Longboard, Quest, Quest Super Cruiser Artisan Bamboo Longboard Skateboard, Skateboard. Bookmark the permalink.